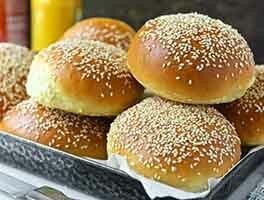 These rolls pack a wide variety of whole grains. 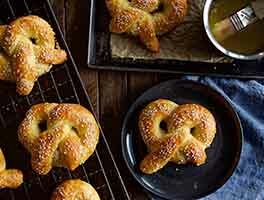 But don't worry, you won't have to buy a dozen different bags of flour for multigrain goodness. Our whole-grain flour blend combines nine whole grains for an easy and convenient shortcut to these soft, moist, slightly sweet rolls. Mix and then knead all of the ingredients — by hand, mixer, or bread machine set on the dough cycle — to make a soft, smooth dough; adjust its consistency with additional flour or water as needed. Cover the dough, and allow it to rise for 60 to 90 minutes, or until it's somewhat puffy though not necessarily doubled in bulk. Divide the dough into 8 equal pieces, and round each piece into a smooth ball. 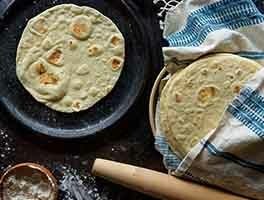 Lightly grease a 9" round pan — we like our stoneware bun pan — and space the rolls evenly in the pan. Cover the pan, and allow the rolls to rise until they're crowded against one another and quite puffy, about 60 to 90 minutes. Bake the rolls for 28 to 30 minutes, until they're golden brown on top and the edge of the center roll springs back lightly when you touch it. A digital thermometer inserted into the middle of the center roll should register at least 190°F. Remove the rolls from the oven, and brush with melted butter, if desired. After a couple of minutes, turn the rolls out of the pan onto a rack to cool. Store well-wrapped at room temperature for several days; freeze for longer storage. Have you tried Instaferm yeast ? We find it's a nice option in multigrain breads. I have made this recipe about 5 times. The dough is easy to work with and the end result is a soft and flavorful roll. I don't have the multigrain flour blend, so have sub'd KAF Regular Whole Wheat. The only other changes I've made are to use regular oats rather than quick-cooking b/c I don't buy quick-cooking, and to halve the salt, as I do with all recipes. Also, I'd like to second another reviewer, that these rolls freeze really nicely. I put the leftovers in the freezer as soon as they are cool. When I re-heat, I do not thaw, but put them from the freezer directly into a 425 oven for 10"; they taste fresh-made. I love this recipe! I started out making the rolls as described in the recipe and they were a hit with the family. I don't always have the time though so I thought what the heck and tried it in my Zojirushi bread machine. Wow! Beautiful high brown loaf that only an end was left after dinner. Its now my go to bread recipe too. I don't usually approve of people who modified a recipe writing a review. But, this is such a awesome recipe I want to incourage others to give it a try. I couldn't find the multigrain flour, and it wasn't in the budget this week to buy the flax and wheat germ. So, I followed the recipe the best I could substituting whole wheat flour for the multigrain, and substituting six grain cereal for the flax & wheat germ. I had to add a little extra water to get the right texture, perhaps because of the six grain cereal? The rolls are soft, flavorful and just wonderful. I will definitely acquire the called for ingredients and make these again. Fantastic recipe! The only difference I made was adding 50% more flax and omitting the wheat germ as I did not have any on hand. These rolls are soft with a tender, closed crumb and pleasant subtle sweetness from the molasses (I used light molasses Grandma's). Everyone enjoyed the rolls and I plan to make this again. Would be great for a Thanksgiving dinner or made into a loaf for sandwiches. Oh my goodness, these were amazing!!!! I added a little melted butter and sprinkle of oats on top right before baking (I used my cast iron pan). They are a very dense roll and so tasty!! I didn't have wheat germ so just made without. What a special treat to go with our Valentine's dinner! Is there any nutrition/calorie info? This is an excellent recipe. I have made it several times now with some modifications the last few times. I used olive oil instead of butter and used all white wheat flour instead of bread flour and it came out soft, moist and delicious. I hm making it into bread loaves and it works great, slices nicely and holds up well for sandwiches. 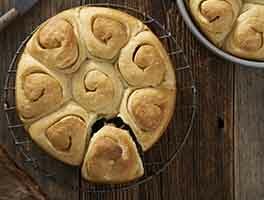 This recipe makes wonderful rolls! I added KA's Whole Grain Bread Improver to the mix and waited 30 min after combining all the ingredients before I started kneading to let the wheat flour absorb the liquid. I used the Ankarsrum mixer for the first time and was amazed by its superior performance. I did add a bit of extra water. The dough came out incredibly smooth - better than I've ever achieved before - it was like velvet. I had to use just a dusting of flour to get the slightly sticky dough out of the mixing bowl. The rolls came out perfectly - high and light. I doubled the recipe and baked in KA's round stoneware pans. These are the tastiest wheat rolls I've ever had! I have attempted to make a multigrain roll/bread many times and have always found the recipe to be on the dense side. 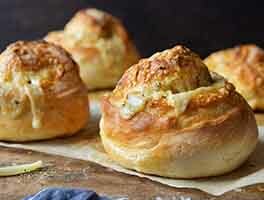 This recipe yields the soft fluffy roll that I have been searching for. I have used the recipe now to make rolls and also used the same recipe to make a loaf - and it made a beautiful soft sandwich style bread. The only change I made when I made bread was changing the 3 TBS of Molasses to 1 TBS Molasses and 2 TBS Honey - as I thought the molasses would compete too much as a bread for sandwiches. As the recipe is written it makes 8 LARGE rolls. 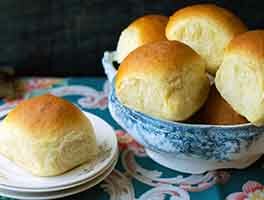 You can easily make 12 rolls from this recipe and still have a decent size dinner roll - probably 16 of the size that you would get from a store-bought bake & serve style roll. It also made 1 standard loaf pan of bread. Keep up the good work King Arthur Bakers - every recipe I try is better than the last!